Order your private HLA test kit now - no need to join a public registry. BoneMarrowTest.com offers easy, affordable HLA testing to help patients and families identify compatible donors anywhere in the world. Welcome to BoneMarrowTest.com. Your search for a compatible donor to treat a blood-related illness starts here: BoneMarrowTest.com provides private bone marrow screening services as well as relevant information about the role of donation in treating a range of diseases. BoneMarrowTest.com helps patients and their care circle of physicians, family and friends identify potential donors of bone marrow, stem cells, peripheral blood cells or umbilical cord blood. 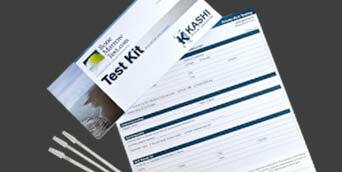 BoneMarrowTest.com provides private HLA testing services through Kashi Clinical Laboratories, a specialized testing facility based in Portland, Ore. Kashi's highly experienced analytical team performs advanced testing on patient and donor samples from around the world. Our standard turnaround time once we receive your sample is three to five business days. We also offer upgraded STAT testing with results in 24 hours. BoneMarrowTest.com was created especially to make today's most precise HLA Testing technologies available to patients' families and friends. Medical choices are between patient, physician and donor. Please review common conditions that may exclude you from donation or consult your healthcare advisor to see if you are eligible to be a donor.